The big news here is that Yelp reviews are back after a passive aggressive battle between Yelp and Google over whether Google could list Yelp’s reviews on Places pages. Yelp has been publicly frustrated by Google’s decision to pump up its Places service with Yelp’s content— without Yelp’s consent. 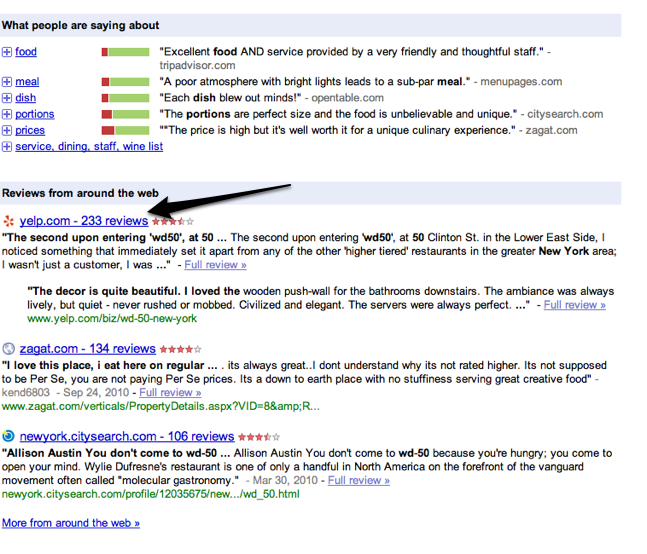 Yelp complained and Google started to remove the reviews from the “reviews” section but still featured Yelp reviews in the “more about this place section,” —- which is the last section of a Google Place page. Of course, the relationship between Google and Yelp is questionable after the startup walked away from a $500 million+ offer from Google late last year. We are in a continuing dialogue with Google to try to work together to ensure consumers are able to find Yelp content easily and fairly. Those efforts are ongoing.